THE B-MOVIE NEWS VAULT: Full Specs & Extras for Scream Factory's THE GARBAGE PAIL KIDS MOVIE: COLLECTOR'S EDITION Blu-ray! Full Specs & Extras for Scream Factory's THE GARBAGE PAIL KIDS MOVIE: COLLECTOR'S EDITION Blu-ray! SCREAM FACTORY UNLEASHES "THE GARBAGE PAIL KIDS" ON BLU-RAY THIS DECEMBER! Holy crap! Of all the movies that Scream Factory could have released, this was the last one I had anticipated! THE GARBAGE PAIL KIDS movie is, if memory serves, pretty awful, but dammit, I LOVED this movie when I was a kid, so this is a must have, based on nostalgia alone! Film Synopsis: When Dodger (Mackenzie Astin) accidentally releases the Kids from their magical trash can prison, all smell breaks loose! Despite their offensive personal habits – and attitude problems – Dodger soon becomes fond of the Kids. But when Messy Tessie, Foul Phil, Valerie Vomit and the whole misfit crew join his fight against thuggish bullies, their efforts just might land them behind bars at the State Home for the Ugly! Based on the wildly popular trading cards, THE GARBAGE PAIL KIDS MOVIE stars singer/songwriter Anthony Newley (DOCTOR DOOLITTLE), Mackenzie Astin (IRON WILL, WYATT EARP), Katie Barberi (THE BRONX ZOO). This grossly entertaining cult classic features great makeup effects by John Carl Buechler (TROLL, DOLLS, GHOULIES, FRIDAY THE 13TH PART VII: THE NEW BLOOD). NEW The Effects of the Garbage Pail Kids Movie – interviews with special makeup effects creator John Carl Buechler and makeup effects artist Gino Crognale. NEW On the Set – an interview with first assistant director Thomas A. Irvine. NEW The Artful Dodger – an interview with actor Mackenzie Astin. NEW The Kids Aren’t All Right – interviews with GARBAGE PAIL KIDS actors Arturo Gil (Windy Winston) and Kevin Thompson (Ali Gator). 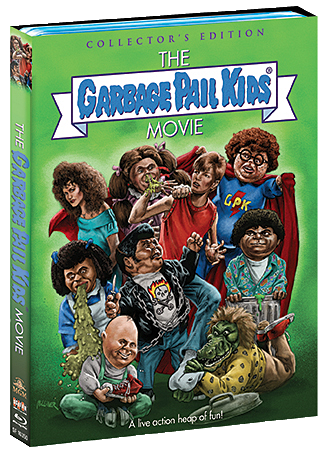 THE GARBAGE PAIL KIDS MOVIE will be available on December 8th wherever Blu-ray discs are sold! You can order it now from AMAZON.COM, or directly from SHOUT! FACTORY, which will net you the disc TWO WEEKS EARLY with an 18 x 24 poster featuring the new cover art! Before you buy it, take a trip down memory lane by watching the trailer for this beloved cinematic atrocity!